Imagine over 2 million people worldwide all spreading kindness at once! 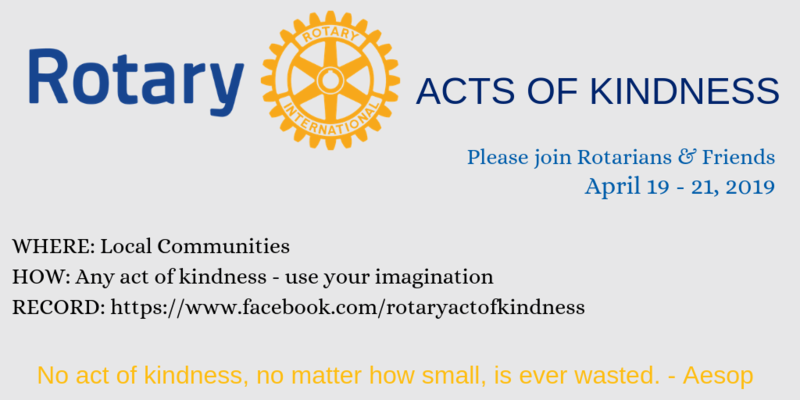 In honor of Paul Harris’s Birthday on April 19th, join Rotarians in random acts of kindness driven by Rotarians and in honor of our Founder. This initiative is being launched for the first time this year by a member of the Burnaby Rotary Club in District 5040 with the hopes that the event will go worldwide within a couple of years. It’s a simple ask of members that can go a long way to make a difference. Please share the details below with your members at your next club meeting. We have created a PowerPoint and poster that can be shared to club members as well. Acts can be done in a group or with a single small act. PLEASE ask your members Not To Use the Facebook page for messages. ONLY POST Acts of Kindness from April 19-21. It is the only way we will get an accurate count.